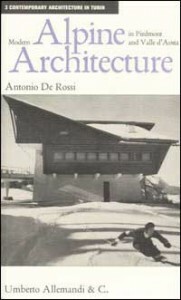 Modern alpine architecture in Piedmont and Valle d’Aost – I.A.M. A trek through Italy’s Western Alps to discover the buildings that have been constructed in the mountains of Piedmont and Valle d’Aosta in modern times: the “invention” of mountain landscape in the 18th and 19th centuries; the birth of tourism; the first winter-sports resorts; mass tourism; diversification of consumer models; current building types for a new way of living in the mountains. A trip in stages, via the projects and buildings of great architects such as Vittorio Bonadé Bottino, Carlo Mollino, Franco Albini, Laurent Chappis, Roberto Gabetti and Aimaro Isola, that reveals the close bonds between Turin and the mountain chain that surrounds it.